Bring 2 inches of water to a boil in a large, deep skillet. Salt the water. Hold a spear of asparagus at each end. Snap and use the natural breaking point as guide to trim the spears. Reserve the stems for soup. Simmer the spears in salted water for 3 minutes, drain and cool. Wipe the pan dray and return to the stove over medium heat; melt the butter. When the butter foams, add the shallot and lemon zest. Stir for 1-2 minutes, then add the asparagus and heat through. Douse with the lemon juice and season with salt; serve. In Recipes-list.com we have selected the most viewed recipes from category - uncategorized . Enjoy the best recipes specially selected for you! 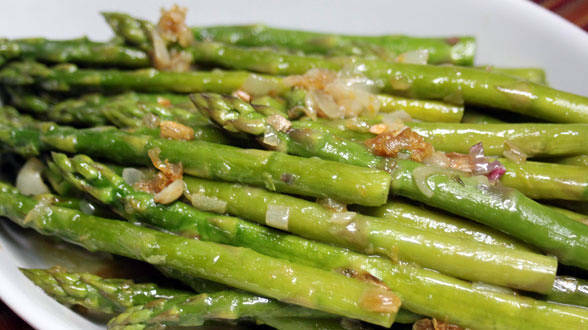 Asparagus Spears is the right choice that will satisfy all your claims.